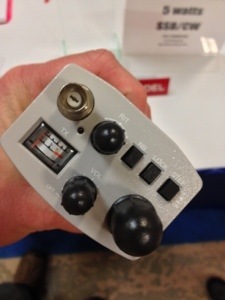 I was very surprised to find this handy talkie, the Tokyo Hy-Power XT-751 HF handheld transceiver, at the Dayton Hamvention. This radio will cover from 40 meters to 6 meters in both SSB and CW. It will also have an internal ATU. It is only a concept radio at this point. 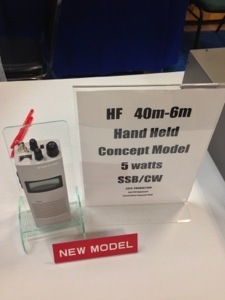 Tokyo Hy-Power hopes to have this radio in production mid 2014. This entry was posted in Announcements, Portable, Product Announcements, QRP, QRP Radios and tagged HT, QRP, Tokyo Hy-Power, XT-751. Bookmark the permalink. Pingback: Nieuwe portofoon voor HF-banden : PI4UTR "Keep the fun alive"
It is nice to see an ht with ssb for hf, but i’ll think that the price is 800 usd to high. We also have the 817 from yaesu wich is a way better price,but its still a yaesu. I’m gonna put the money on the new 817 when it comes arround. Nice rig as handheld but 1200 usd dollar is to expensive, maybe as i have enough money. I have the FT-817 from yaesu that’s a realy nice rig too. For what it’s worth, someone with Tokyo Hy Power hinted to me that they’d like to keep this under $800, maybe even in the $600-700 range. I almost feel like that’s ambitious for them, but $600 would be an excellent price point if it’s a performer and built as well as their concept prototype. I had their previous model HT and believe me they are cool. But don’t expect to get out unless you have a seriously good band opening. Meaning that you can really only use this a few times a year. I sold mine because I would rather put that money towards something I can talk on all the time and any time. Was neat to have it and show it to other hams. does anyone know where I could purchase a used 20 meter qrp ssb rig ?